Laurence along with Ron Ashby joined the Hong Kong Naval Volunteer Force in November 1937. 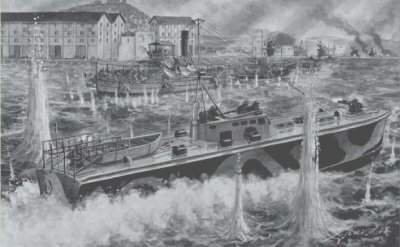 The HKNVF later mobilized as the HKRNVR when the United Kingdom declared war on Germany in 1939. I had the pleasure of knowing Laurence and he gave me an insight to life with the 2nd MTB Flotilla. Sadly he passed away in January 2006. The allied military objective was to deny Kowloon harbour to the Japanese and stop Japanese troops deploying to other theatre's of war in the Far East. 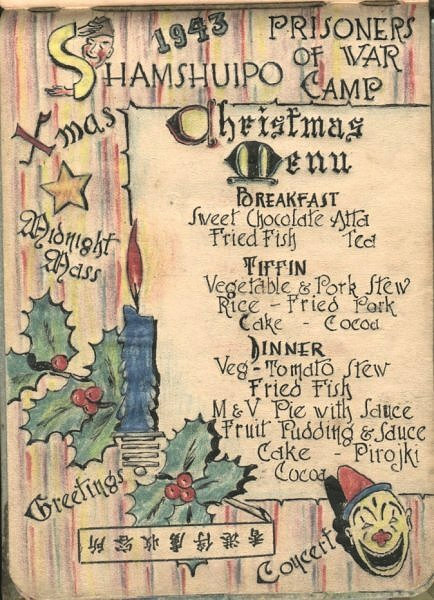 Extracts from the diary by Lt L.D.Kilbee HKRNVR late O/ C MTB 08 & ML French and 1st Officer MTB 10 written during his early days in a Japanese P.O.W camp when events during the battle were still fresh in his mind. With the outbreak of hostilities on the 8th of December, as the Japanese crossed the border and bombed Kai Tak the Flotilla moved lock stock and barrel to Aberdeen. The operation was completed without mishap, and by sundown all boats were fueled and ready to take up their designated night time positions as a striking force. 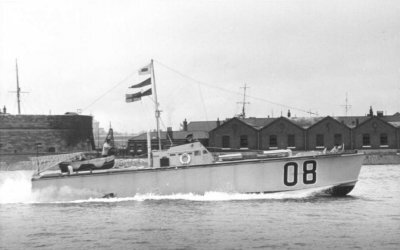 8th, 9th, and 10th of December: There was much enemy aircraft activity during daylight in which the Flotilla was involved in one way or another, but unless doing a specific job the boats kept as inconspicuous as possible. HMS Cicala took the brunt of enemy air attacks in the Castle Peak and Cap Shui Mun area. No enemy aircraft appeared at night. 10th December: MTB 08 with MTB 10 went on night patrol off Po Toi, and ordered to investigate suspicious vessel near the Lemmas (N.E. Head). 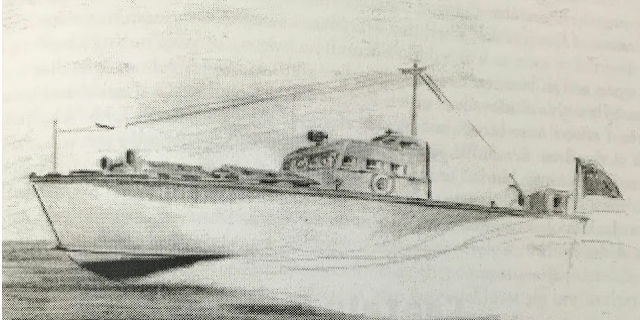 After steaming for half an hour, observed searchlight to the South, made preparations for attacking when signal received to return to patrol off Po Toi. Disappointing outcome made worse by news of sinking of Repulse and Prince of Wales off Singapore. Lt Ronnie Ashby whose motto was "Be Just and Fear Naught" led the flotilla in MTB 07 with Jix Prest & Buddy Hide at the controls, pressing home the attack under withering fire from land, sea, and air, suffering heavy losses in the process. Only three MTB's survived to limp back to base in Aberdeen. Lt Kennedy on MTB "09" towed the stricken "07" back to base.The attack was arguably the most daring daylight MTB attack of all time, and was referred to as “The Balaclava of the Sea.” by Coastal Forces world wide. They were hailed "The bravest of the brave." 12th December: Evacuation of troops in the Kowloon Bay area continued during the night. MTB 11 damaged but able to return to base. Next day December 13th destroyed C.B's, then proceeded to Kowloon Bay to contact 4 A.V.P's overdue. Passed through Sulphur Channel, found 2 AVP's and told them to return to Deep Water Bay. Went through harbour at 30 knots keeping well to Hong Kong side. Fired on from Holts Wharf, no casualties On reaching Lye Mun, spotted 2 remaining A.P.V's and told them to return to Deep Water Bay via Tathong Channel, depressing site, many sunken vessels. One engine breakdown off Collinson, so returned to Aberdeen on 2 engines. Later in the day proceeded to Green Island (engine repaired) to evacuate lighthouse personal. Damaged propeller on uncharted rock. Mount Davis under heavy shell fire. Just before sunset Japanese plane dropped a stick of bombs which landed in dock area. No boats damaged, but one bomb set oil drums alight on dockside, which started fires fanned by strong wind. Worked MTB 08 out of the dock with the aid of AVP Perla, and was towed out to mid stream. 14th December: Remained all day in Aberdeen waiting to go on slip (MTB 11 not ready to come off until next day) December 15th, bad news. Thracian ran aground during the night off N.E. corner of Lamma and had to go into dock, MTB 11 still on slip. 16th December: Worst day of the battle for me and my crew. Having been hoisted onto the slip during the night, biggest air raid on Aberdeen dock this morning, enemy after Thracian. About noon large formation of planes dropped bombs from high level; the target was Thracian our biggest warship. I was in Aberdeen Industrial School building with my crew having lunch. The damage in the dock was extensive and by the time I got there MTB 08 was well on fire and became a total loss. Thracian further damaged, so that evening she was towed out to Round Island (opposite Repulse Bay) and beached. 17th & 18th December: I took over the duties of Base MTB officer. During my time in this job, before I went to MTB 10 as 1st Lieut, I was ordered to take over ML French (R.A.S.C) and embark Cdr. Peers, C. O. of Thracian and salvage party, and take them to Thracian. I did two such trips. 21st December: H.M.S. 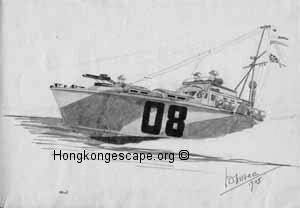 Cicala attacked by a number of enemy planes in East Lamma Channel, and finally sunk after putting up a brave fight. One killed, and two wounded including a number of minor casualties MTB 10 and other small craft picked up survivors during the engagement, during which Lt. R. Goodwin NZRNVR. 1st Officer of MTB 10 was wounded and taken to hospital with other casualties. From then on I was relieved of my duties as Base MTB officer, and took over as 1st officer of MTB 10. 22nd December: Enemy advances across Hong Kong Island from the East; Aberdeen Base and the Peak area are now within range of the Japanese guns and troops closing in. MTB 10 ordered to take ammunition to pier at Stanley Bay for our troops holding out there. Returned safe and sound to Aberdeen. Next day MTB's could only hide by day, and hope for the best as the Japanese troops closed in. I lost touch with my crew as I could not get ashore to get to the Base at Aberdeen. 25th December: Very difficult to know what is happening on shore, but obviously the situation is desperate. Enemy aircraft still active as boats bombed while at anchor on the South side of Apliechau Island. Surrender came late afternoon. Everyone was on edge waiting for orders. At dusk MTB 10 moved to pier (Waterfall Bay) to await VIP's, who were to try to escape under night cover up the coast to Mirs Bay area. I discussed staying in MTB 10 for the escape with my C. O. Cmdr Gandy who insisted I remain back with some of my crew. Finally scrambled ashore in Telegraph Bay to eventually spend nearly four years in various Japanese Prisoner of War Camps. Lieutenant L. D. Kilbee H.K.R.N.V.R. MTB 08 on full throttle covering the measured mile in East Lama Channel 1941. 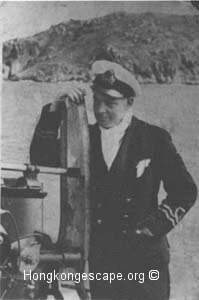 Lt Kilbee took command of the War Department Launch "French," operated by the RASC under the blue ensign, briefly between losing MTB 08 and being appointed 1st Officer on MTB 10. The WDL's were from the same stable as MTB' 07-12. Drawing from "Hong Kong Recollections of a British Prisoner of War" by Bill Wiseman. MTB 08 drawn from memory By Laurence Kilbee after his release from POW. HMS Tamar : Scuttled 12 Dec 1941 Kowloon Harbour. Thracian [D86] Admty Type Destroyer: Damaged by grounding 15 Dec 1941 off Lamma Island and subsequently scuttled by being run aground on Round Island in Repulse Bay on the evening of 16-17 Dec 1941. Salvaged 10 July 1942 by the IJN, repaired and placed in service 25 Nov 1942 as patrol vessel No.101. Reclassified 15 Mar 1944 as special training ship No.1. Returned to the British Navy Oct 1945. Sold for breaking up Feb. 1946. Built by Hawthorn Leslie (Hebburn) and launched 5 Mar 1920 but transferred to Sheerness Dockyard for fitting out and completed 21 Apr 1922. Moth : Damaged by JAAF bombers 12 Dec 1941 and scuttled as a block ship. Salvaged 1 July 1942 by the IJN, repaired and placed in service as the gunboat Suma. Sunk 19 Mar 1945 on the Yangtze River near Kiangying by a US air-laid mine. Tern Scuttled 19th Dec 1941 in Sham Shoo [Deepwater Bay]. Redstart : Scuttled 19 Dec 1941 in Deepwater Bay. MTB 07 : Scuttled at Nano in Mirs Bay 26 Dec 1941. MTB 08 : Burnt out by JAAF bombers 16 Dec 1941 during an air raid on Aberdeen DYd. MTB 09 : Scuttled at Nano in Mirs Bay 26 Dec 1941. MTB 10 : Scuttled at Nano in Mirs Bay 26 Dec 1941. MTB 11 : Scuttled at Nano in Mirs Bay 26 Dec 1941. MTB 12 : Sunk on the morning of 19 Dec 1941 while attacking Japanese landing craft off Kowloon. Ran into a sea wall and foundered after being hit by artillery fire. MTB 26 : Sank on the morning of 19 Dec 1941 after attacking Japanese landing craft off Kowloon. Crippled by artillery fire and sunk later by JAAF aircraft. MTB 27 : Scuttled at Nano in Mirs Bay 26 Dec 1941. Aldgate : Scuttled 19 Dec 1941 in Deepwater Bay. Barlight : Scuttled 19 Dec 1941 in Deepwater Bay. Salvaged by the IJN, repaired and placed in service 20 Sep 1942 as the minelayer Ma 101. Surrendered Aug 1945 and sold to the Chinese Navy in 1947. Taken over by Chinese Communist forces in 1949. Indira : Sunk by JAAF bombers 15 Dec 1941 alongside Aberdeen Dockyard. Watergate : Scuttled 19 Dec 1941 in Deepwater Bay. Cornflower : Bombed in Aberdeen harbour 9th Dec. Scuttled in Deepwater Bay 19th Dec .
Ebenol : Scuttled 19 Dec 1941 in Deepwater Bay. Alliance : Scuttled 19 Dec 1941 in Deepwater Bay. Port Chaucer : Scuttled 19 Dec 1941 in Deepwater Bay. Diesel Berthing Tug (Polly) C 410 : 26 Dec 1941 Scuttled in Mirs Bay. Two other destroyers, HMS Scout and Thanet, sailed 8 Dec 1941 from Hong Kong for Singapore and so escaped loss. 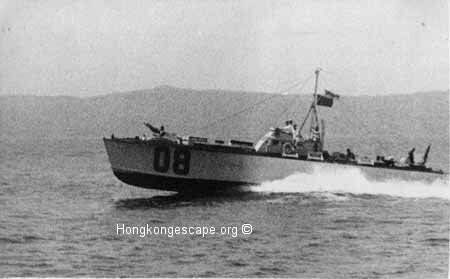 Thracian was retained at Hong Kong to close some gaps in the pre-war minefield (she was fitted for mine laying at the time). After being damaged by grounding on the night of 15-16 Dec while attempting to engage Japanese river steamers near Kowloon she could not be docked for repairs because of damage inflicted on the Aberdeen Dockyard by JAAF bombers and so was scuttled. Rated as boom defense/gate vessels at time of loss. Formerly the merchant vessel Embleton requisitioned for naval service as a tug/auxiliary patrol vessel 23 Apr 1940 (ex-HMS Kildysart a sloop built for the RN in 1918). Cornflower : Scuttled 19 Dec 1941 in Deepwater Bay. Cornflower - RNVR drill ship, formerly the 'Arabis' class sloop of the same name that had been built for the RN during WW1. Tamar was originally a troopship of 4650tons launched in 1863 that had been hulked as a base ship at Hong Kong in 1897. Cdr Hughe.M. Montague S.N.O. Aberdeen R. N. Retired records the above vessels fates in his report held by the Public Records Office (PRO) at Kew. The Senior Naval officer, Hong Kong, gives one destroyer, four gunboats, eight M.T.Bs., seven A.P.Vs. (Auxiliary Patrol Vessels), and an auxiliary craft used for minefield duty (not a fighting unit). (Interview with Commodore A. G. Collison, C.B.E., R. N. (retired), at C.M.H.Q., 27 Jun 46).